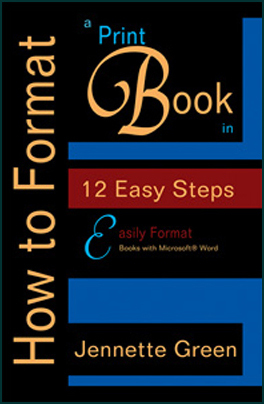 In this book, you will learn simple techniques to turn your manuscript into a professional looking print book, using Microsoft® Word 2003 or Microsoft® Word 2010. Take advantage of the author’s years of experience producing professional book files for satisfied clients. Her tips and tricks to mastering the technical details of publishing a book are presented in a simple, step-by-step format that anyone can understand. Dozens of accompanying illustrations make learning the steps even easier. Use this book to make your publishing dreams come true today! Have you written a fiction novel or a nonfiction book that you would like to publish? Would you like your book to be distributed to the major book retailers, such as Amazon and Barnes & Noble? You can do it, and it is more simple than you could imagine. 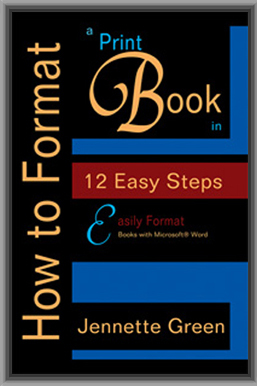 This book will give you simple, step-by-step instructions on how you can use Microsoft Word 2003 or Microsoft Word 2010 to create a quality, professional looking book, ready for printing with Lightning Source and CreateSpace. The only software required is Microsoft Word 2003 or Microsoft Word 2010, and Adobe® Acrobat® Professional (version 7 or higher). Additional Note: The comprehensive edition, Book Formatting for Self-Publishers, A Comprehensive How-To Guide, includes information on Amazon’s “Look Inside” program, as well as additional helpful information about publishing your book through Lightning Source or CreateSpace. It is available in both Kindle and paperback editions. First, a little bit of background. Since you have bought this book, I assume you know that Lightning Source and CreateSpace are the two major players in the Print on Demand (POD) industry. Just for clarification, “Print on Demand” means that a book is printed only when a customer orders it. In this model, publishers do not need to purchase books, or keep inventory piled up in their garages. CreateSpace is geared toward authors with single titles, and Lightning Source (LSI) is geared toward publishers (or authors starting their own publishing houses) who will publish multiple books. CreateSpace’s file requirements are simpler to understand and meet than LSI’s. Lightning Source is well known for their complicated requirements for file submissions—-especially for cover submissions. But we will get to covers in a different book in this series. Both LSI and CreateSpace will make your print book available for distribution to major book retailers through their relationship with Ingram. Ingram is a wholesaler/distributor, and Lightning Source is a part of the Ingram Content Group. The main differences between LSI and CreateSpace are the prices they charge for file uploads, proof costs, and the discount you can set for retailers. By the way, although Ingram makes your book available to major book retailers, such as Barnes & Noble, and your book will be shown as “available” in their online bookstores, getting the retailers to actually stock your book in their “bricks and mortar” stores is another issue entirely. At the time of this book’s publication, Lightning Source charges $37.50 each for the interior book block and the cover file, for a total of $75 for each book submission. In addition, they charge $12 per year to include your book in their catalog, which will ensure that your book will be distributed to Barnes & Noble, and will also have access to their worldwide distribution channels. LSI also offers an option where you can pay $60 so that your book will be included their Ingram Advance catalog for one month. Most POD publishers do not choose this option, because books from LSI are placed at the back of the catalog. As far as I know, no POD publisher has yet documented a benefit from paying to be included in the Ingram Advance catalog. It is highly recommended that a publisher view either a print proof, or a free electronic proof, for each book uploaded. If you find errors in your document and would like to submit a new book interior or cover file to LSI, the minimum charge is $40 per file. This means that if you want to make changes to both the text and the cover, you will be charged $80. Ouch! Better to get it right the first time. This cost per file applies even if you disapprove the proof and want to make changes to correct issues. Where LSI shines in comparison to CreateSpace is the discount you can set for retailers. For clarification, the term “discount” means the percentage of profit a retailer/wholesaler takes from the book’s retail price. The standard discount is 55% of the retail price. Under the 55% discount model, Ingram, the distributor, takes a 15% discount from the book’s retail price for their profit, leaving a 40% discount (profit) for the retailer, which is the minimum retailers require in order to carry the book in their “bricks and mortar” store. This leaves 45% of the book’s retail price for the publisher. However, unless you manage to get your book accepted by Barnes & Noble’s small press department, or unless you have an extremely effective marketing campaign, it is unlikely that Barnes & Noble bookstores will carry your book on their shelves. After all, big name publishers vie for space, and often pay hefty prices for end cap displays, and for other featured spots. So, it may not be wise to set a discount of 55% on your book if the major bookstores probably won’t carry it in their physical bookstores, anyway. LSI allows publishers to set the retailer discount as low as 20%. This means that you will receive 80% of the retail price of the book (minus the printing cost for the book). This means more money for you. Another upside of the 20% option is that Amazon will carry your book, and so will Barnes & Noble online, and other online retailers will, too. Even better, customers who visit a “bricks and mortar” Barnes & Noble store can order your book, just like any other book in publication. 1. A $10 book at 55% discount means that $5.50 goes to Ingram and the retailer, and $4.50 goes to you. Out of this $4.50, you must deduct the cost of printing the book (see the LSI US POD Ops Manual, mentioned earlier, for printing prices). 2. A $10 book at 20% discount means $2.00 goes to Ingram and the retailer, and $8.00 goes to you, minus the printing costs. CreateSpace is a different story. If you select their Expanded Distribution Channel (EDC), which provides access to the same distribution network as LSI, (EDC also includes libraries and academic outlets), you must set a discount of 60% for retailers, which means considerably less money in your pocket. What’s more, the books are not returnable (a necessity required by retailers), so they will not carry your book in their physical stores anyway—not much different than the 20% model, is it? Except with the 20% model you make more money, and have more control over your price. To make a reasonable profit in the EDC program, you must price your book well above your competition, which is a distinct disadvantage for sales. Note: Although the EDC does not offer returns, many seasoned POD publishers recommend that you do not offer returns with LSI, either. Some publishers have been hit hard with returns a year down the line, after selling a large number of books to a retailer. Their profit turned into a loss. While CreateSpace (CS) may not offer the best discount terms, it does supply other advantages to self-published authors. CS will provide you with a free ISBN, if you do not have your own ISBN, and it is free to set up your files with the “do-it-yourself” option. The “do-it-yourself” option includes distribution to 1) your own Amazon CreateSpace eStore (a 20% retailer discount is required), and 2) the option to distribute to Amazon’s website (a 40% retailer discount is required). However, if you would like to include your book in CreateSpace’s EDC program, you must pay $25, and, as previously mentioned, a 60% retailer discount is required. In addition, CreateSpace’s latest literature for the EDC program states that there is a “$25 book update fee for each new file change request.” Please note that this charge applies only to books opted into the Expanded Distribution Channel program. The file requirements for CreateSpace are not as rigorous as for LSI, and CS offers various do-it-yourself helps and options on its website. Of course, CS also offers a number of book publishing services. CreateSpace is happy to help you with all of your files—for a price. But why pay them, when you can easily do it yourself?